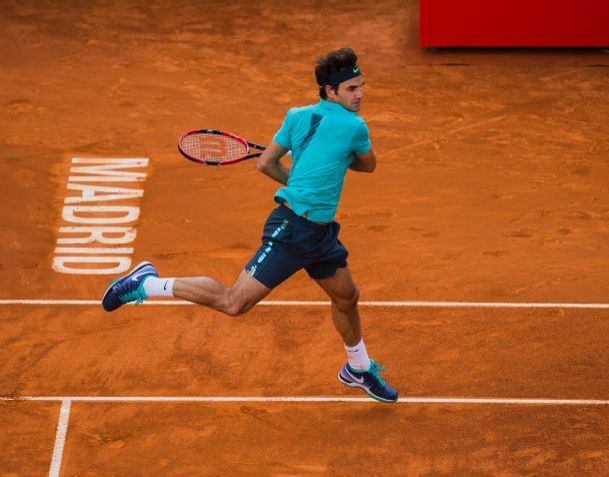 Top-seeded Roger Federer made an early exit from the Madrid Open on Wednesday after a narrow, second-round loss to Nick Kyrgios. The 20-year-old Australian ended Federer's hopes of a fourth title at the Spanish tournament by rallying for a 6-7(2), 7-6(5), 7-6(12) victory. Kyrgios saved two match points on his serve at 6/7 and 10/11 in the third set tie-break. Federer made Kyrgios sweat, saving five match points at 5/6, 7/8, 8/9, 9/10 and 11/12. At 12/13, Federer mis-timed a forehand wide. Kyrgios is in form, having reached the final at the Estoril Open before losing to Richard Gasquet. The 2014 Wimbledon quarterfinalist also relinquished his status as the ATP's highest-ranked teenager by turning 20 last week. Kyrgios broke serve in the first game, but Federer did not panic. With the young Australian serving for the set at 5-4, Kyrgios dropped to 0/40. Although Kyrgios saved two break points, Federer's depth of groundstroke reaped dividends to level the scoreline. The top seed went on to run through the tie-break to end a 42-minute set. Federer maintained his momentum, breaking in the opening game and began to expose Kyrgios' strategy for returning serve. But Kyrgios responded to lead 3-2 and continued to play with greater aggression. There were no break points in the deciding set. Kyrgios hit 22 aces to Federer's 16 and both players won 78 per cent of their first service points. Federer said his problem was that ''I couldn't return his first serve,'' adding: ''Just a horrible performance on the return. "As the match went on it got so bad that I just couldn't get into decent positions on the return, so it made it very difficult to get any sort of rhythm after that. "But credit to him for serving well and keep doing what he was doing. But I'm very disappointed by that. That's what cost me the match, in my opinion." Kyrgios said he had been excited at the prospect of playing his childhood hero. ''Last night it was a bit tough to get some sleep,'' he said. ''I've been playing well recently on the clay, so I knew I had a good chance to go out there and do well. I stuck to my game and served well and I got the win. "I think he's the greatest of all time. I knew before the match that I would have to play one of the greatest matches I have ever played, I wasn't intimidated at all," the remarkably composed 20-year-old said courtside following his victory in two hours 37 minutes. "It doesn't really feel real at the moment. It's a strange feeling. It's pretty exciting." Three-time former Madrid champion was full of praise for Kyrgios, admitting, "He's got a wonderful serve and good potential, so I hope he keeps working hard and that he can compete for the best spots in tennis. "It was a fast paced match in terms of we don't take much time between points. I expected it to be difficult match. Federer and Kyrgios both trained together prior to last year’s Roland Garros. "He likes the big stage," added Federer. "He's got nothing to lose, no fear, and he's got a great game. He can rely on his serve so much. It keeps him in the match regardless of he how he plays from the baseline." Federer drops to 21-4 on the season, which includes three ATP World Tour titles at Brisbane (d. Raonic), Dubai (d. Djokovic) and Istanbul (d. Cuevas). It was the first time that Federer had lost to a player aged 20 or under since the 2009 US Open final (l. to del Potro, 20 years, 11 months).